Does Baltic Amber Really Work? Spark of Amber sent me a necklace for my daughter to review. I am being compensated for this post, but all comments and opinions are mine. My daughter wears her Baltic Amber teething necklace every single day. So I have heard lots of comments from “Look at the fashionista in her little necklace,” to “Do they really work?” to “I have heard those are a choking hazard and voodoo.” Yes, I have really heard all of those! I feel like there are so many misconceptions when it comes to Baltic Amber, that after watching a debate go down on a friend’s Facebook page about it recently, I decided it was time to dig a little deeper and dispel some common misconceptions about Baltic Amber. Baltic Amber is a fossilized resin, found in the Baltic Region, especially Lithuania. Succinic acid (a natural analgesic) is found in the external layer of Baltic Amber and is the ‘healing oil’ of Baltic Amber. These healing oils are said to be anti-inflammatory, anti-toxic, and anti-bacterial and work particularly well for relieving teething pain, irritability, and even inflammation of ear, nose, and stomach areas, as well as headaches, bronchial infections, and various skin issues. Baltic Amber has also been used to boost energy and strengthen the immune system. While many think that the use of Baltic Amber is a new fangled idea, the truth is that it has been used for centuries among Europeans for its healing properties. Baltic Amber is not meant to be chewed; instead, it is worn as jewelry against the skin. Necklaces and bracelets are the most popular ways to wear Baltic Amber. When worn on the skin, body heat warms the stones enough to release small amounts of oil, which are then absorbed through the skin and into the bloodstream. My daughter started drooling a lot at an early age. By the time she was two months old, we were going through 3-5 bibs per day that she would drench. I knew she was too young to be teething, but I also knew it wouldn’t hurt for her to start wearing a teething necklace. I ordered one from Spark of Amber, and she started wearing it during her awake time when she was about three months old. I had heard horror stories from friends about weeks of a crabby baby, and sleepless night after sleepless night, so I mentally prepared myself, but remained hopeful that the necklace would be enough to get us through the tough teething period. On her five-month birthday (to the day!) her first tooth came through, and she had four more appear over the course of the next three months. And guess how much sleep was lost during that time? None. Zilch. Zero. Nada. The only reason I even knew she was teething was because she gets an ever-so-slight diaper rash right before a tooth pops through (and it took me a few teeth to figure this pattern out). She was slightly more clingy during this time and was crabby on the day the first tooth popped through, but otherwise we didn’t even notice a difference in her behavior. Twice I didn’t even know she had a new tooth until my mom felt for them when she was visiting! When we were aware that she was teething, I would apply diluted clove oil to her gums at nap and bedtime, and we occasionally used Hyland’s teething tablets (especially for that first tooth). Choosing a quality Baltic Amber necklace seems simple enough, but unfortunately a number of scammers have taken advantage of desperate parents and created fake necklaces that not only don’t work, but may not be safe for your child either. These necklaces are usually cheaper than true Baltic Amber, which is enticing for parents on a budget. Don’t be fooled! So how do you make sure that the necklace you are getting is real Baltic Amber? First and foremost, buy from a reputable company. We get our necklaces from Spark of Amber and have been very pleased with their products. The owner works directly with suppliers in Lithuania that she has a personal relationship with, and every piece of Amber sold has been professionally examined and is 100% authentic. I can’t stress this enough…always choose a reputable source for Baltic Amber. I can think of nothing worse than having a teething, crabby baby and spending money on a solution that you were told would work only to find out later that it was a fake. It is worth doing the research (but look, I already did it for you!) and spending a little extra to make sure you have the right product! The naysayers of teething necklaces say that the necklaces are a choking hazard. I completely disagree with this. Spark of Amber has recommendations for length, but basically the necklace should fit loosely around your child’s neck, but should not be so long that it is in their line of vision when looking down. My 9 month old, who literally puts every possible thing in her mouth, has never once messed with hers while wearing it. Baltic Amber necklaces should be knotted in between each individual bead, so if the necklace were to break, only one piece would fall off. Never leave your child unattended while wearing the necklace, and be sure to remove the necklace when the child is sleeping (we double the necklace and use it as an anklet under a sock at night). We also remove the necklace for bath time and swimming, although there are mixed suggestions on whether or not that is necessary. To clean your Baltic Amber, simply wipe with a soft cloth. If you need to use water feel free, and then dry in the sun. I really can’t recommend these necklaces enough. I have been so thankful for quality Baltic Amber from Spark of Amber during my daughter’s teething and we will continue to use them with her and future children. 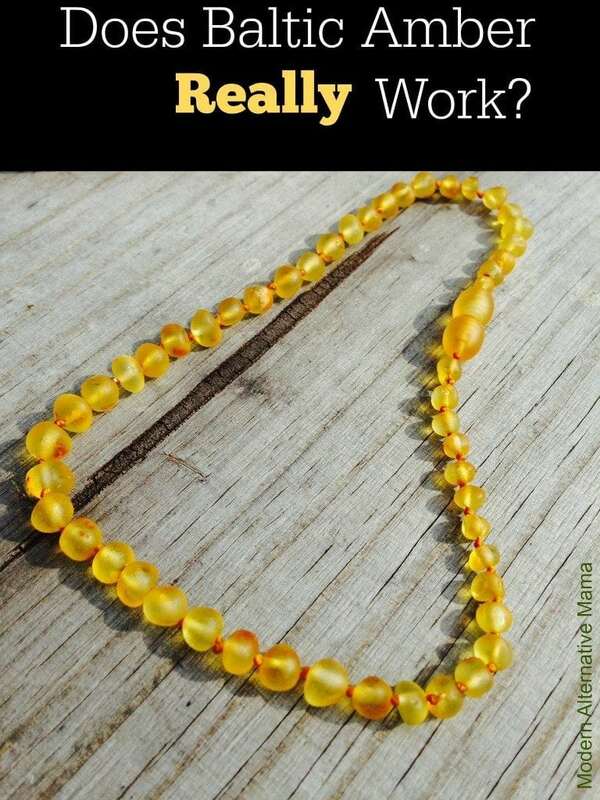 Whenever I hear or see someone complaining about teething issues with their babes, I always suggest a Baltic Amber necklace from a reputable source. Have you used Baltic Amber? What ailments have you used it for? Did your daughter stop drooling so much when you started the necklace? I use one for my arthritis. I have a necklace and a bracelet. My older children used them when their molars were coming in. They tell me it helped relieve the pain. The bonus is that they are verbal, unlike the teething toddlers. My son used an anklet for teething and it worked amazingly well. Later, we shared his same anklet with two other babies who were also greatly helped. All three of us moms were very skeptical, but desperate. I’m so glad we tried! My daughter loved the look of an amber necklace on herself two years ago, at 6. It was intended as a baby gift for a friend, but I let her keep it. Weeks later we realized she wasn’t suffering from her usual nightly growing pains in her legs. And when she did wake up with pains, we would find her necklace on the bathroom counter. Now both of our kids, 8 and 6, wear amber daily. Thanks for spreading the word on this helpful tool. Is there a difference between the raw verses the polished nuggets? Does one work better than the other? Interesting blog. Your baby’s teething pattern (and behaviors) seem to be exactly the same as my baby’s, except I’ve never put an amber necklace on her. Seems to be a huge stretch to conclude that amber really works, when you don’t have anything to compare against. Perhaps teething just doesn’t bother your baby that much – as with mine. Hey! I was wanting to read this post but it’s not showing anything except the comments. And the new layout is very slow. Not sure if the post got lost in the switch. I hope not!! It may be something to look into. Thanks! 4 kids…..never worked, looked cute and trendy but much more relief with hyland teething tablets and mortin. if I had to do over again I’d skip the necklace.